The night after Mira was born, I couldn’t sleep. I had so many things going through my mind and I was reeling a little from how my life had changed overnight. As I lay awake, I decided to go down to visit her in the NICU. Plus, I needed to get up and walk around to help begin the healing process for my C-section. As I walked very slowly to the NICU around midnight, I saw a mom being wheeled out of labor and delivery with her baby in her arms. I turned to congratulate her and as I turned back to continue on my journey, I nearly collapsed into tears. 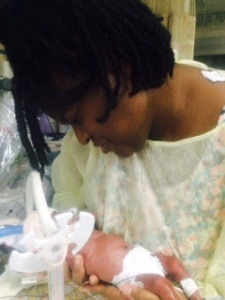 I gripped the hand rail and sobbed all the way to the NICU door, as I cried out to God “I can’t hold my baby, I can’t care for her, I can’t do anything for her.” I just felt helpless. And, as I’ve now learned, helpless is the worst feeling in the world for a mother. By the time I made it to the door of the NICU, I had gotten myself together but still felt sad. What I didn’t know is that God had a surprise in store for me behind those doors. When I walked in, Mira’s nurse informed me that she was monitoring her vitals and if all still looked good in a couple hours that she would be feeding her milk for the first time. She then went on to say, “If you’re still here, do you want to feed her?” My mind was blown at the thought of feeding my baby. I mean how serendipitous that I was in the NICU at the exact time that she would be eating for the first time. A couple hours passed and I was actually able to get some sleep next to her bedside. When it was time to feed Mira, the nurse blew my mind again by asking, “Do you want to change her diaper first?” Of course, the tears came. I cried as I changed her diaper and then fed her 1mL of milk through her tube via a syringe. For every mother or father out there who is feeling helpless, believe me when I say that you can still parent your baby through the holes of their incubator. I know it might seem like an impossibility but, as God taught me one late night in the NICU, every little bit counts. Over these past eight weeks, I’ve learned parenting through presence is more than enough. Just because they are not physically with you, they still need all the things a baby needs. My advice is to get into a routine – I found out when the nurse typically changes her diaper or does her “cares” (the assessment done at each shift change) and made that my typical visiting time. That way, I can create a routine for Mira and also make sure that I am able to do some of the things for her that I’d be doing if she was home with me. Don’t let the feelings of helplessness keep you from doing what comes natural. Every touch and encounter makes a difference.